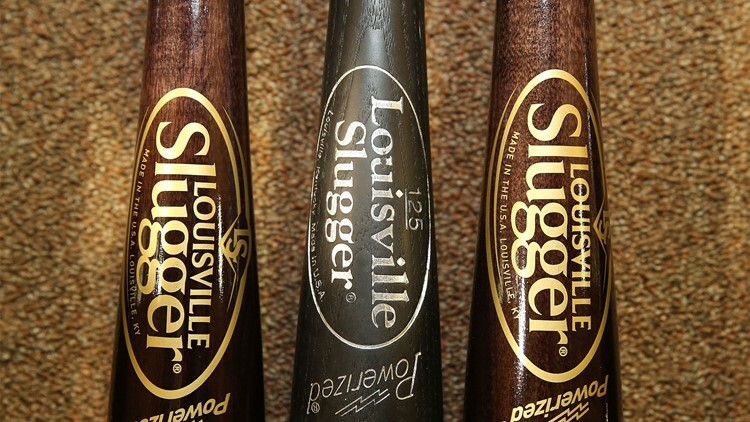 The new logo for the Louisville Slugger bat is on display on the bats on the left and right with the old logo from last year in the middle inside the Louisville Slugger Museum and Plant on April 1, 2013 in Louisville, Kentucky. The Slugger brand was acquired by Finland's Amer Sports Oyj in 2015. LOUISVILLE, Ky - — (Louisville Business First) - China-based Anta Sports Products Ltd., along with a consortium of other investors, is close to a $5.2 billion deal to buy Finland's Amer Sports Oyj, The Wall Street Journal reports. This is a deal of note locally because Amer Sports owns Wilson, which bought the Louisville Slugger brand back in 2015. There's been talk about a deal between Anta Sports and Amer for the last few months in the international press. Other investors in the consortium include tech giant Tencent Holdings Ltd. and Chip Wilson, the Canadian billionaire and founder of athletic-apparel retailer Lululemon Athletica Inc., the story says. In a separate post, reporter Charley Grant riffs on this news for WSJ's "Heard on the Street" column. Grant writes that trade tensions between China and the U.S. have dominated the headlines for months. Click here to read the rest of the article on Louisville Business First.